North Korea has conducted 15 ballistic missile tests so far in 2017. Here's what to know about each of the tests that have already occurred this year. In February, North Korea successfully tested a land-based KN-15 missile, a new solid-fuel intermediate-range missile, which traveled 310 miles into the Sea of Japan. Gen. John Hyten, the commander of U.S. Strategic Command, told a congressional panel in early April that the February launch marked a significant advancement for North Korea because it was its first successful solid-fueled missile fired from a mobile launcher. Mobile-launched missiles are harder to track and can be fired at short notice. Hyten labeled the launch of what is now believed to have been a KN-15 missile as “a major advancement” by North Korea because it was "a new solid medium range ballistic missile off a new transporter erector launcher." The February launch occurred as Japanese Prime Minister Shinzo Abe visited President Donald Trump at his Mar-a-Lago estate in Florida over the weekend. Photos taken by the club's patrons and later posted on Facebook captured Japanese and U.S. officials responding in real-time to the incident, sparking criticism about why such important meetings were not conducted in a more secure location. In early March, North Korea launched five medium-range Scud-er (extended range) missiles. Four traveled more than 600 miles, the upper limit of their range, into the Sea of Japan. The fifth took off, but later crashed. Three of missiles landed in waters in Japan's economic exclusion zone, which extends 200 miles from its shoreline. An undated picture released by North Korea's Korean Central News Agency on March 7, 2017 shows the launch of four ballistic missiles by the Korean People's Army during a military drill at an undisclosed location in North Korea. Shortly after this test occurred, the U.S. delivered the Terminal High Altitude Area Defense (THAAD) anti-missile system to South Korea, a process which the U.S. started working on with its ally after the flurry of North Korean missile tests in 2016. THAAD is a missile defense shield designed to intercept short and medium range missiles. Later in the month, North Korea tested a mobile-launched missile which exploded "within seconds of launch," according to U.S. Pacific Command. The launch was near Kalma in eastern Wonsan province, where North Korea previously attempted to test its mobile-launched Musudan intermediate-range ballistic missile. 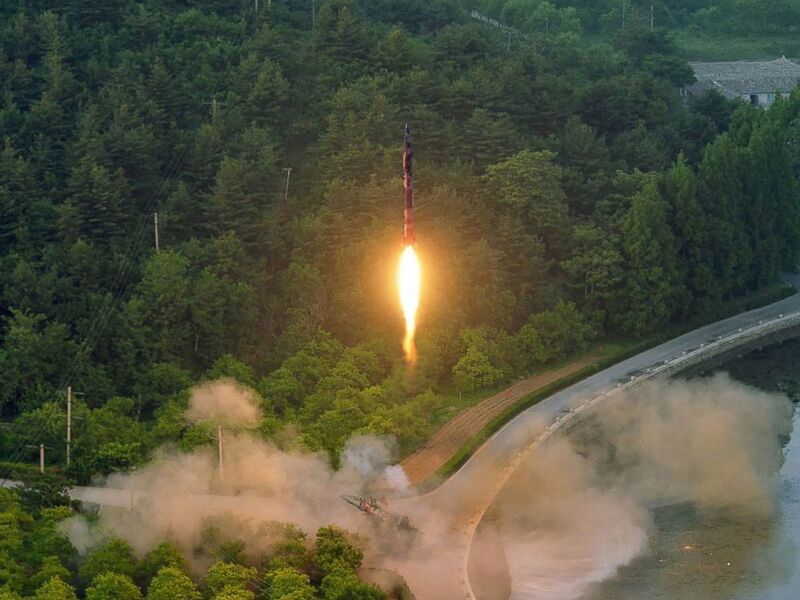 Last year, North Korea test-fired eight Musudan rockets, but only one was considered a success. U.S. officials have not identified what type of missile was tested on March 21 since it exploded so soon after launch. On April 4, a KN-17 missile launch came just days before Chinese President Xi Jinping met with Trump at Mar-a-Lago, during which the pair discussed how to curb North Korea's missile and nuclear programs. The Trump administration is hoping China will exert its economic influence over North Korea since the country controls eighty percent of all foreign trade with the reclusive regime. U.S. officials said the missile spun out of control and landed in the Sea of Japan after traveling 34 miles. It was being assessed as an in-flight failure. U.S. Secretary of State Rex Tillerson released a terse statement following Tuesday's test, saying, "North Korea launched yet another intermediate range ballistic missile. The United States has spoken enough about North Korea. We have no further comment." The KN-17 is a new mobile-launched, single-stage missile that uses liquid fuel. It has not been successfully tested by North Korea, so it's difficult to assess its full range. Less than two weeks later, North Korea launched another KN-17 that exploded shortly after launch. "The launch failed very early on, so that makes it harder to know exactly what they were trying to do," Susan Thornton, acting assistant secretary of state for East Asian and Pacific Affairs, said days later. "But I think that our understanding is that it was not one of the longer-range missiles that they were trying to test there; it was something like a medium-range ballistic missile." Vice President Mike Pence was briefed on the failed missile launch en route to South Korea on Air Force 2. While speaking with U.S. members of the military in Seoul, Pence described it as a "provocation." "This morning's provocation from the North is just the latest reminder of the risks each one of you face every day in the defense of the freedom of the people of South Korea and the defense of America in this part of the world," Pence said. "Your willingness to step forward, to serve, to stand firm without fear inspires our nation and inspires the world, and it's an honor for us to share this meal with you today." North Korea fired a KN-17 for at least the third launch in April; this time the missile traveled 21 miles before breaking up in mid-air, according to a U.S. official. A U.S. Pacific Command spokesman noted that it was "aware of the event" but gave no further comment in the immediate aftermath of the launch. The U.S. believes the ballistic missile North Korea launched was a KN-17 medium range missile, not a new intermediate range missile. The launch was the first successful test of this type after several previous failures. Launched from Kusong, in western North Korea, the missile flew for 435 miles before landing in the Sea of Japan, 60 miles from the Russian border. The Japanese Defense Minister Tomomi Inada told reporters that the missile reached an unprecedented altitude of 2,000 kilometers (1,245 miles), which raised speculation that North Korea may have developed a new intermediate range missile. Experts claim the missile would have flown a much greater distance if launched on a maximum trajectory, perhaps reaching military bases in Guam. This picture taken on May 14, 2017 and released from North Korea's official Korean Central News Agency (KCNA) on May 15 shows a test launch of the ground-to-ground medium long-range strategic ballistic rocket Hwasong-12 at an undisclosed location. North Korea boasted the "medium long-range" ballistic rocket is capable of carrying a heavy nuclear warhead, but most experts view that claim with skepticism believing the North Koreans have yet to perfect the necessary technology. The missile was first seen publicly in a military parade in Pyongyang on April 15. On May 21, the White House confirmed that North Korea successfully launched a medium-range ballistic missile with a shorter range than missiles in previous tests. The South Korean military said the missile traveled over 500 kilometers (just over 300 miles) into the Sea of Japan. A U.S. official told ABC News that it was a KN-15, the same solid-fueled missile tested on February 11 that can be fired at short notice. North Korea said shortly after the test that they were ready to mass produce medium-range ballistic missiles capable of reaching Japan and US military bases there. This test occurred as Trump was in Saudi Arabia, the first stop on his first foreign trip as president. This undated photo released by North Korea's official Korean Central News Agency on May 30, 2017 shows a test-fire of a ballistic missile at an undisclosed location in North Korea. On May 28 at 10:40 p.m. Hawaii time, North Korea conducted its ninth test, a short-range ballistic missile launched from near Wonsan Airfield. The missile was tracked for six minutes by U.S. Pacific Command before it landed in the Sea of Japan. A U.S. defense official told ABC News it appeared to be a SCUD-type missile. North Korea said this latest launch was aimed at testing a new precision-guidance system. North Korea launched, for the first time, a two-stage intercontinental ballistic missile (ICBM) to mark the U.S. holiday of July 4. The missile was launched into a high-altitude trajectory of 1,730 miles and flew horizontally about 577 miles into the Sea of Japan. 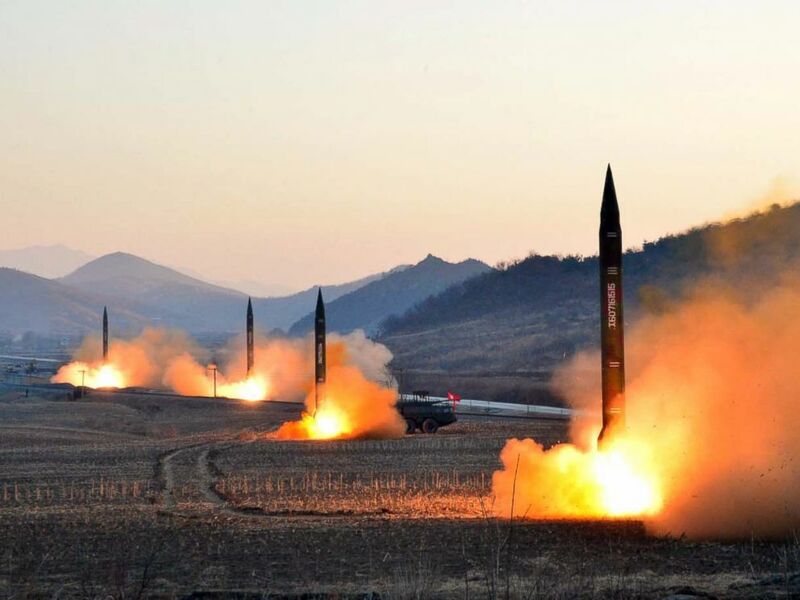 The missile emerged from the north of Kusong, a city located in the far northwestern corner of North Korea, an area used for launches in the past. Three weeks after its first ICBM launch, North Korea tested a second ICBM from Mupyong-ni, in the far north of the country, near an arms plant. It traveled 621 miles laterally for 45 minutes and landed in the Sea of Japan, inside Japan’s Economic Exclusion Zone, about 88 nautical miles west of Hokkaido. It marked the longest flight of a ballistic missile in North Korea's history, according to the Pentagon. 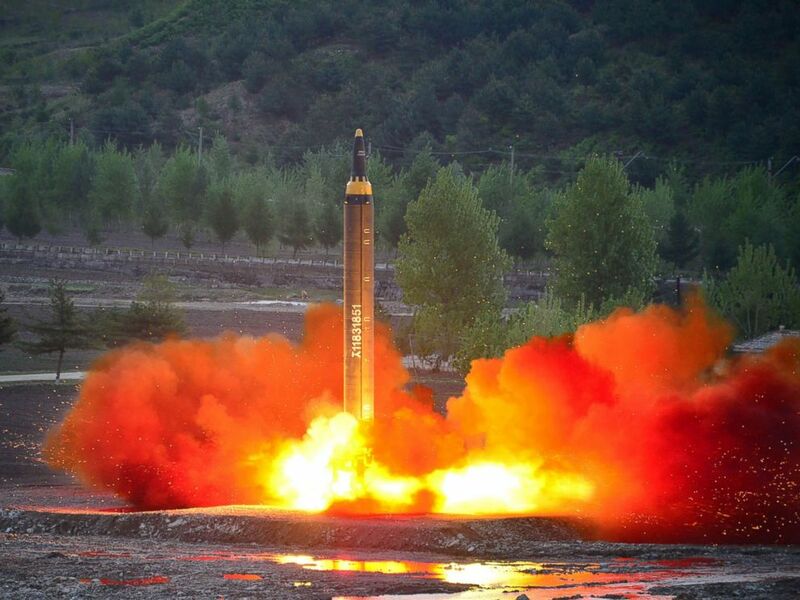 According to the South Korean Joint Chiefs of Staff, the ICBM traveled 2,300 miles into space. Experts fear that if North Korea angled the trajectory of that missile, it could potentially travel as far as Washington, D.C., or New York. In a statement, Trump condemned the launch, saying that North Korea's "second such test in less than a month" is the "latest reckless and dangerous action" by North Korean leader Kim Jong Un's regime. U.S. officials had suspected a test could occur on July 27 to mark the North Korean holiday known as "Day of Victory," which celebrates the end of hostilities in the Korean War in 1953. But rainy weather at the launch location and technical difficulties appeared to have prevented a launch then. PACOM confirmed that North Korea fired three short-range ballistic missiles into the Sea of Japan with the first and third failing in flight. The second "appears to have blown up almost immediately," PACOM said. The launches came after escalating rhetoric between Trump and Kim. The Pentagon and Japanese government each confirmed a North Korean missile traveled over Japan and landed in the ocean. A U.S. official later said that the missile fired was a KN-17 intermediate-range missile that flew 1,667 miles horizontally and broke apart at the end of its flight. The flight path of a missile spurred a notification to Japanese citizens from the country's emergency alert system. In response, Trump issued a statement that "all options are on the table" and continued to criticize North Korea for its "threatening and destabilizing actions. North Korea launched a missile over Japanese airspace U.S. officials confirmed. The missile passed over Japanese airspace near Hokkaido, the same prefecture under which a KN-17 intermediate-range missile traveled on Aug. 28. Japanese broadcaster NHK reported that the missile traveled up 478 miles high and traveled for about 2,300 miles. Secretary of State Rex Tillerson called on “all nations” to take measures against North Korea, specifically named China and Russia. “China and Russia must indicate their intolerance for these reckless missile launches by taking direct actions of their own,” Tillerson said in a statement. North Korea launched an intercontinental ballistic missile which flew for approximately 50 minutes, soared 2,800 miles into space and achieved the highest altitude and longest flight duration of any North Korean trial launch to date. The missile, a two-stage KN-20 which was launched previously, was sent from Sain Ni, North Korea, and traveled about 621 miles horizontally before splashing into the Sea of Japan, within Japan's exclusive economic zone. NORAD, the North American Aerospace Defense Command, determined the launch did not pose a threat to North America, its territories or allies. Shortly after the launch, South Korea responded by conducting a joint precision target drill, utilizing land-, sea- and air-targeting capabilities. The launch constitutes North Korea's 15th missile test in 2017, and third-ever ICBM test. ABC News' Karma Allen, Michael Edison Hayden, Paola Chavez and Kevin Pliszak contributed to this report.